Presidential elections were recently held in Kazakhstan, ahead of schedule. 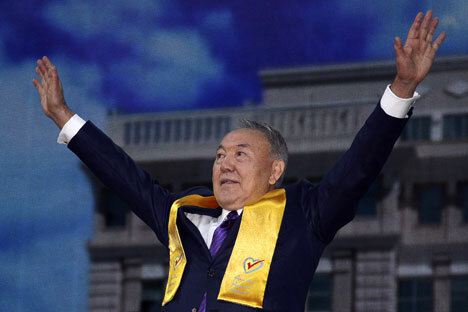 The incumbent head of the Republic Nursultan Nazarbayev emerged the winner, garnering over 97% of the vote. While many have called these elections uncontested, such uncontested elections suit Russian interests. Moscow warmly welcomed the re-election of Nursultan Nazarbayev as President of Kazakhstan, the largest country in Central Asia. For Russia, Kazakhstan acts a buffer state between Russia and the volatile Central Asia Region. It is also an important economic partner. Analysts have said that if Nazarbayev leaves the scene, Moscow risks losing one of its most crucial allies. The fate of the Eurasian Economic Union would also become uncertain. “In the recent history of Kazakhstan, there have been practically no contenders for the role of the first citizen. Nazarbayev, for the vast majority of the population, is the guarantor of stability,” political scientist Alexander Knyazev told RIR. Kazakhstan remains one of the least problematic states for Russia in post-Soviet space; as Nazarbayev appreciates his country’s relations with its northern neighbour. He is aware that cooperation with Moscow fetches more benefits to his country than confrontation. Astana is one of the driving forces of the Eurasian integration project. “In the Kazakhstan establishment, everyone understands that Russia is our closest partner. The people also understand this. It is most likely that the president will work to ensure that, after his departure, relations remain at a high level,” Daniyar Kosnazrov, Head of Department for the Study of Central Asia and the Caspian Region, at the Library of the First President of Kazakhstan, told RIR. This is despite the fact that tensions exist between the two countries, particularly about the way in which Eurasian integration is being pursued. The stability of Kazakhstan rests primarily on the personality of Nazarbayev. However, he is 74 years old and, once he is out of the scene, the country may see the rise of very dangerous forces. Inter-ethnic conflicts could see a rise. Events in Ukraine have shaken up post-Soviet countries with large Russian populations. Russians account for almost 24% of Kazakhstan’s population, and are concentrated in the northern regions, close to the Russian border. Meanwhile, some analysts believe that the destabilization of Kazakhstan may serve the interests of the Americans, who are trying to deprive Russia of its allies. “Some political analysts say that the tons of dollars brought onto Bishkek, were destined not to destabilize Kyrgyzstan, but Kazakhstan,” said Sobyanin.